Amp: Ampere, amp for short. An amp is the standard unit of electrical current. This is one of the measurements of how much electricity you have available for use or how much electricity is being used by your truck camper to run your appliances, AC, heater and more. 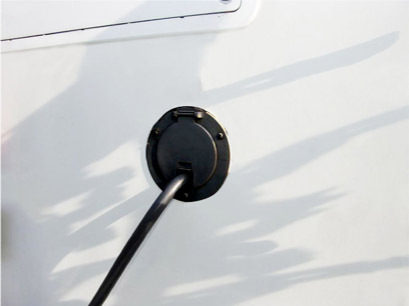 Whether your RV has a 20, 30, or 50 amp shore power cord, these are all just measurements of how much AC power will be available for use by your RV. A simple way to look at the power available is to think of these numbers in terms of thousands. For example, an RV with 115-volts available and a 30 amp cord would have 3,450 watts available. For comparison, a common wattage for a microwave is 1000 watts so at 115 volts, it would use approximately 8.69 amps. Watts divided by volts = Amps. Boondocking: Very similar to dry camping, boondocking is camping in your RV without any hookups. The difference between dry camping (usually in parking lots or in towns) is that boondocking is camping in a remote location. Camper: Also refers to the RV itself. A camper is also known as a truck camper or slide-in. CAT Scale: A place where you can weigh your fully loaded vehicle and trailer. This allows you to know the full weight so you don’t go over the GCWR (Gross Combined Weight Rating). Curb Weight: The actual weight of a vehicle or trailer. This includes all standard equipment with full fuel tanks but doesn’t include the weight of people or gear. Dry Weight: Not to be confused with the curb weight. The dry weight is the weight of the RV without fuel, freshwater, propane or passengers. Dually: Also known as a dual rear wheel pickup truck, or light-duty tow vehicle. The major difference between a dually and a standard truck is that the dually has four tires on the rear axle rather than two. Shore Power: An external power source. Instead of using an internal battery or fuel source you can plug your shore power cord into an outside outlet to use power for your appliances. Since the conductors in your shore power cords are made of copper, it’s best to make sure that they’re protected with a lock for the shore power cord to prevent theft and damage, such as the Fortress PowerLock. 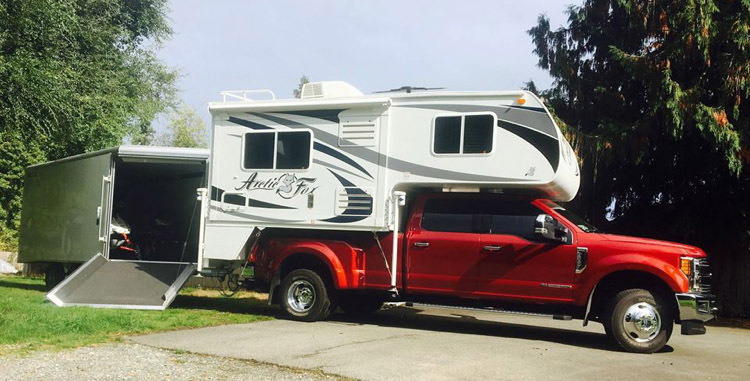 Slide-In: Another term for a truck camper. Also known as a camper. Slide-Out: Not to be confused with slide-in. This term refers to an area within the truck camper that can be electronically pushed out to expand the living space. 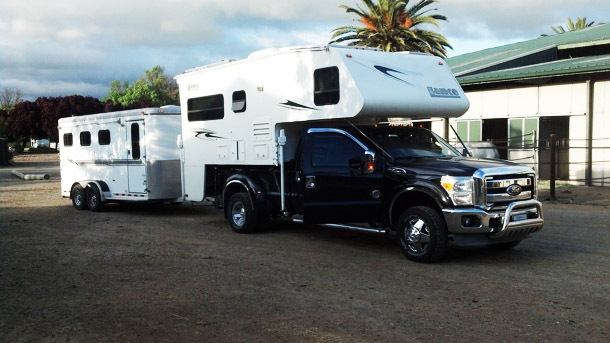 Truck campers currently have four options for slide-outs that range from none to three slide-outs. Winterizing: The process of making an RV safe from the hazards of winter storage in cold locations. 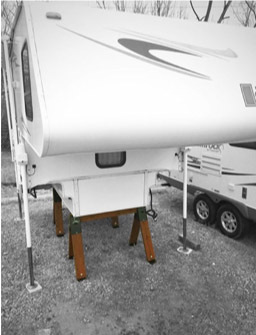 This includes truck camper storage stands, preventing truck camper wobble and more. People known as “snowbirds” won’t have to worry about these weather conditions since they RV in the warm climates of the south during winter months. There are many checklists available that you can download or read including these five easy steps to winterize your truck camper. GCWR: Gross Combined Weight Rating. The maximum allowable weight for (a) the road vehicle with passengers and cargo, and (b) the trailer with loaded cargo. A vehicle’s GCWR is a function of its engine torque, transmission capacity, transmission ratio, driving axle capacity, tire capacity, and the chassis capacity. GTW: Gross Trailer Weight. This is the total weight capacity a trailer is rated to carry by the manufacturer, only applies to the trailer – not the vehicle. GAWR: Gross Axle Weight Rating. Not to be confused with GVWR. Gross Axle Weight Rating is the maximum weight that a trailer axle can safely handle for towing. GVWR: Gross Vehicle Weight Rating. For trailers, GVWR describes the total weight carrying capacity of a trailer including the weight of the trailer and cargo loaded inside. 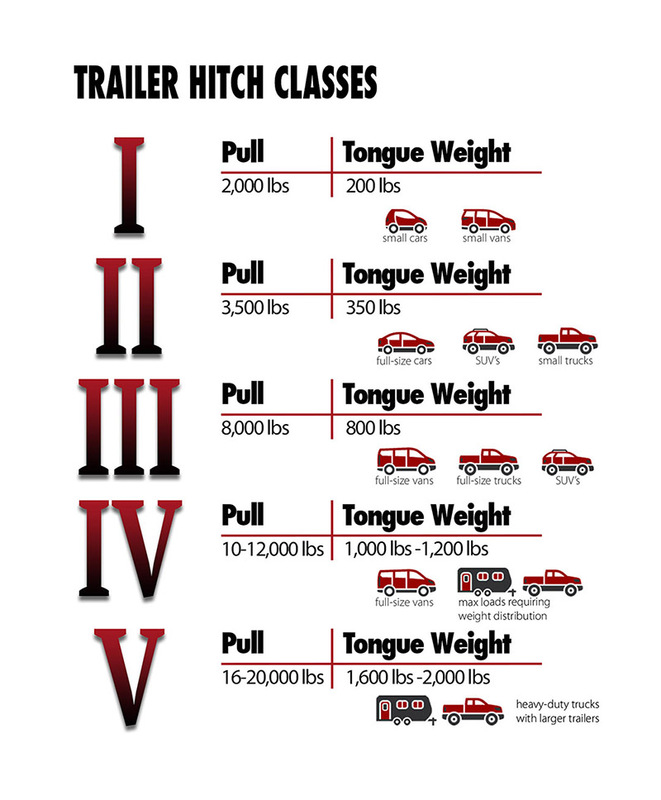 Hitch Class/Rating: The weight that a hitch can tow behind your truck. Available from Class I to Class V hitches. The hitch rating is assigned by the manufacturer and through extensive testing they determine how much the hitch is designed to handle. For example, the Torklift Original SuperHitch trailer hitch can handle 2,000 pounds tongue weight and tow 20,000 pounds with weight distribution. Payload Capacity: Refers to how much weight a truck can carry including passengers and cargo in the cab and bed. Not to be confused with towing capacity but these measurements can affect each other. A typical truck camper set up needs at least 350 pounds of excess payload capacity (GVWR minus the wet/loaded weight of the rig) to be considered for towing. Truck campers with overhang usually require at least 450 pounds of excess payload. Tongue Weight: The downward force exerted on the hitch ball by the trailer coupler. Tongue weight (TW) is incredibly important – if you are hauling a trailer that has too much tongue weight, it could cause hitch failure and extensive damage. 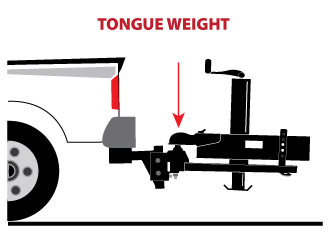 Tongue weight should be somewhere between 10-15 percent of the Gross Trailer Weight (GTW). Towing Capacity: Not to be confused with Payload Capacity. Towing capacity is the amount of weight your hitch can tow. Towing Capacity is calculated by subtracting a truck’s posted GVWR from the loaded/wet weight of the camper. That gives you tongue weight (TW). You don't want your tongue weight to be too light or too heavy, but just right for towing! 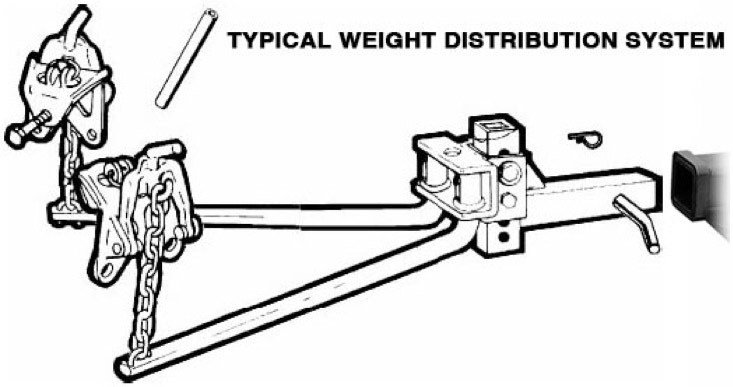 Weight Distribution Hitch: Designed to help level a trailer and vehicle by distributing the weight across the tow vehicle and trailer. Typically recommended for trailers that weigh over 3,500 pounds or more. Not all weight distribution systems are rated at the same capacities, so ensure you get the one that best fits your towing needs. For steps on setting up a weight distribution system, watch the video below or visit our weight distribution page for written instructions. Wet Weight: Not to be confused with dry weight. Wet weight is the weight of the RV with oil in the engine and with full fuel, water, gray water, black water, clothes, gear and propane tanks. This weight is incredibly important because it’s the exact amount that you’ll be towing and hauling with your truck and you’ll need to stay within weight ratings to prevent potential damage and hitch failure. 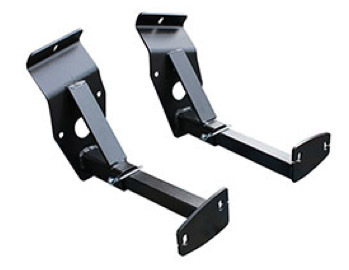 Ball Mount: The ballmount is the part of the hitch system that supports the ball that inserts into the hitch receiver and connects the hitch to the trailer coupler. If you’re going to be towing behind your truck while you’re hauling, the ball mount will insert into the receiver of your extension and attach to the trailer coupler. Measuring for the correct ball mount height is easy. 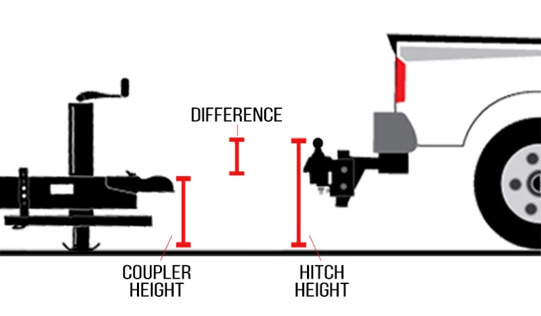 All you need is the height of the coupler while the trailer is level (from the top of the coupler) and the height of the hitch (from the top of the receiver). Then you adjust the ball height so the coupler is the same height as before the trailer was attached to the ball. The difference between them is the rise or drop that you will need for your ball mount. 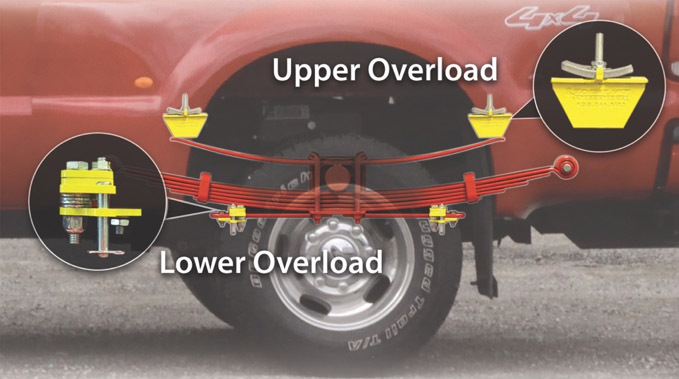 If the hitch height is greater than the coupler, you’ll need a ball mount with a drop. If your coupler height is greater than your hitch, then you’ll need a ball mount with a rise. An example of a trailer coupler. This attaches to your ball mount for towing. Brake Controller: For use while towing behind your truck and truck camper. The brake controller is a unit mounted inside your vehicle that allows the electric brakes on the trailer to activate harmoniously with the braking of the vehicle that’s doing the towing. Break-Away System: A very important system. 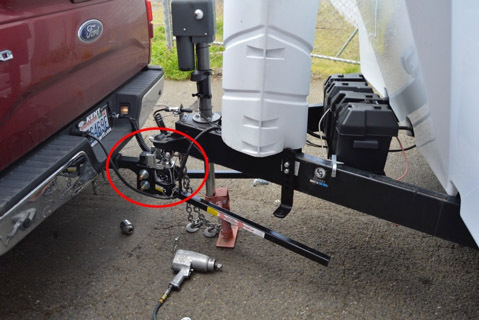 It’s designed to automatically lock the trailer brakes in the event of a hitch failure and where the trailer may break away from the tow vehicle. Coupler: The part of the trailer that attaches to the ball mount that’s located in the receiver of the hitch. It’s good to make sure to regularly check the coupler to maintain it and prevent rust. Tie Downs: the best way to secure your truck camper to your truck, used with turnbuckles. There are two types of tie downs available: bed-mounted and frame-mounted. For example, Torklift’s frame-mounted tie downs are designed to incorporate independent tie down points that bolt directly to the truck’s frame. Frame-mounted tie downs are guaranteed to prevent bed and bumper damage and rust that are commonly found with bed-mounted tie down systems. 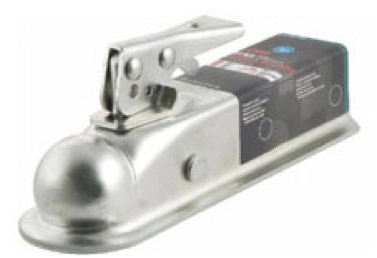 Also, when Torklift steel or aluminum and stainless steel tie downs are paired with any fully spring-loaded Torklift FastGun turnbuckle, we warranty the truck frame and camper anchor points for the extent of the manufacturer’s warranty. The FastGun installs in seconds! Turnbuckle: Also known as the ‘hold down’ portion for your truck camper. Turnbuckles are used with tie downs to make sure your truck camper stays attached to your truck while you’re hauling it down the road. 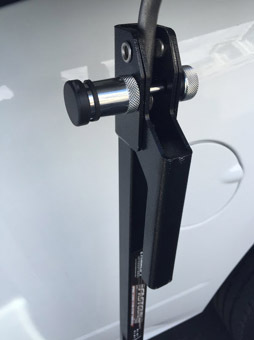 The best example of a truck camper turnbuckle is the number one selling FastGun. These stainless steel truck camper turnbuckles come in sets of two and are spring-loaded with spring tension indicators. What does that mean? It means that you can quickly determine the correct tension needed to hold down your truck camper. Once set, you don’t have to repetitively re-adjust, reducing the time it takes to load and secure your camper. Suspension: A system of tires, tire air, springs, shock absorbers and linkages that connects a vehicle to its wheels and allows relative motion between the two. The suspension must support both handling and ride quality which are at odds with each other when you are towing heavy loads. If you are going to be hauling a truck camper then it’s best to consider suspension enhancements. A good example of this is the StableLoad suspension upgrade that reduces sag, porpoising, side-to-side sway and more while towing and hauling. There are many suspension upgrades available. Watch the video below to see how each of them compare when it comes to handling, cornering and more when loaded with 2,800 pounds of weight. Questions? Contact us for more information or questions at support@torklift.com or by calling our tech support team at 800-246-8132. View the original article in Truck Camper Magazine. ©2019 Torklift International Incorporated. All rights reserved.